How do weathermen and women predict the weather? How can you tell if an earthquake is going to happen soon? There is no exact way to do any of these things. But there is a way to make an educated guess. You have to watch and observe collected data over a period of time to see if you can spot any patterns, and then try to predict what will happen next. You will now need your math journal and a pencil. 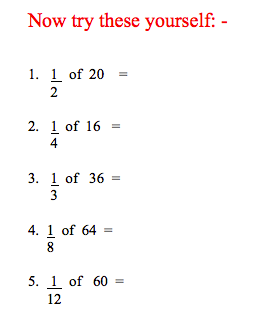 To warm up your brain into a pattern finding mode, find the next few numbers in these number pattern problems. 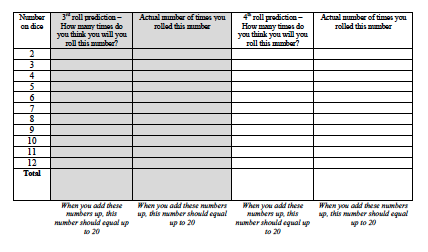 Copy each problem into your journal, and fill in the blanks. Write down at the very end of your pattern what the rule is for each problem. 1) 1, 5, 9, 13, 17, 21, 25, ______ , ______ , ______ . 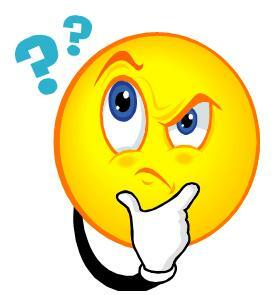 2) 88, 108, 128, 148, 168, 188, 208, ______ , ______ , ______. 3) 115, 109, 103, 97, 91, 85, 79, ______ , ______ , ______. 4) 6, 10, 14, 18, 22, 26, 30, ______ , ______ , ______. 5) 672, 622, 572, 522, 472, 422, 372, ______ , ______ , ______. 6) 23, 34, 45, 56, 67, 78, 89, ______ , ______ , ______. 7) 1, 3, 7, 15, 31, 63, 127, ______, ________, _________. Warm enough? Jump to the next part! 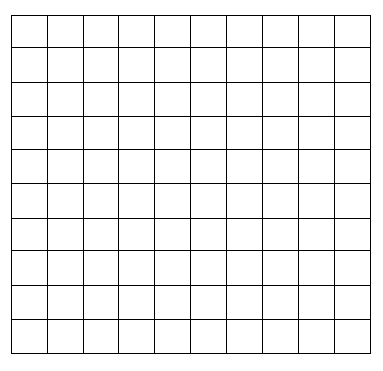 You will now have a go at watching and observing collected data to see if you can spot any patterns. First you need to collect some data! You will be rolling the dice 20 times. You will be recording how many of each number (the total of both dice) you get using tally marks. You will do this a total of four times. The objective is to notice an patterns and trends, and see if you get better at predicting the numbers you will roll in only 20 rolls. Then actually roll the dice 20 times. Record what you get using tally marks. When you are done, see how good you were at predicting by comparing your prediction and the actual numbers you got. Try to get better in the next three times you do this. 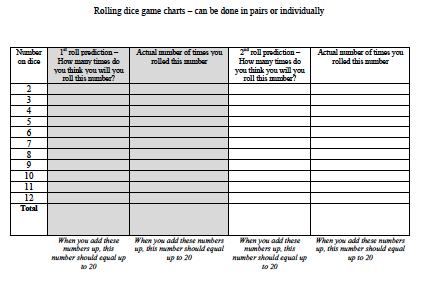 Here is the second half of the ‘Rolling dice game chart’. How easy was it to learn from the data? How good were you at predicting? Did you get any better in the 2nd, 3rd, and 4th roll? Why/why not? What were some of the problems you had while doing this activity? If you had to do this again, how would you improve it? ‘Here they all are!’ I shouted. I saw my nine friends coming up the drive way. It was my very first sleepover that night, and Mum and me had made lots of delicious snacks to eat. Everyone piled in and we immediately went to the kitchen and demanded food. Mum put a tray of brownies on the table. She had already cut the tray of brownies into nine perfect pieces (about 7cm x 7cm / 3″ x 3″). We all immediately saw the problem. ‘Mum! There are ten of us!’ I said. We all thought about it, and couldn’t figure it out, so we decided to ask YOU for help. How would you make sure that everyone got an equal share of brownies? Remember… it is very important that everyone gets AN EQUAL share of the brownies, otherwise someone will cry about it! Work in pairs – you have to prove that your idea works! Use any manipulatives or pieces of paper you need to help you prove your thinking to work out this conundrum . Use the correct language of fractions and mathematics when explaining what you and your partner did. Your post must include a written explanation, and a conclusion that begins with the sentence – ‘Each person gets ….. of a brownie’. Follow the instructions. Use the cubes to figure out the answers. 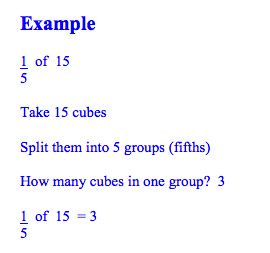 Use the example to follow how to write your answers. Ha! I bet you thought that you should only learn spelling and do vocabulary words when writing stories, hey? You will need your math journals, a pencil to write with, your ruler, and some coloured pencils. Draw a line using your ruler after each one. This is what Bill and Ben came up with. 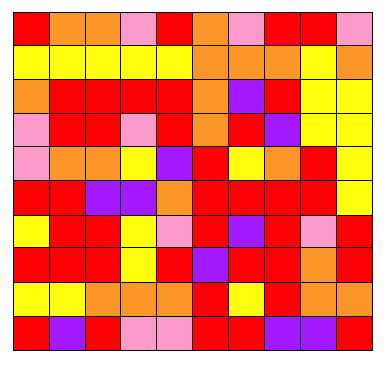 Ben would plant four flowers in each square. This would give him 400 flowers! Of course he had no way of knowing what colour the flowers would be when they grew. You will need to work in pairs for this next part. You will need an A3 sheet of paper, and some pencils. NO calculators! How many red flowers are there? 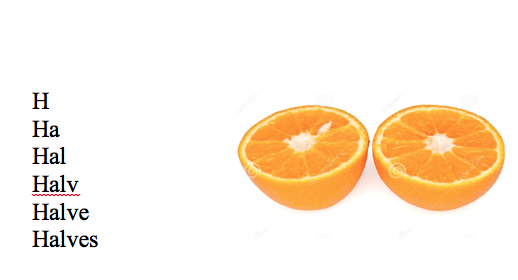 How many orange flowers are there? How many pink flowers are there? How many blue flowers are there? If you add all these flowers up, what is your total? Is that correct? 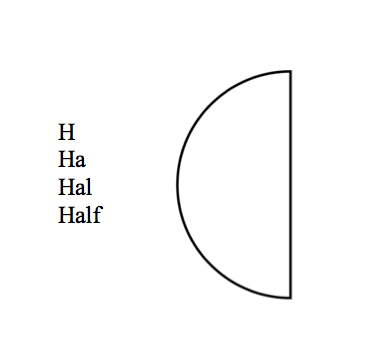 Are you ready to talk fractions? 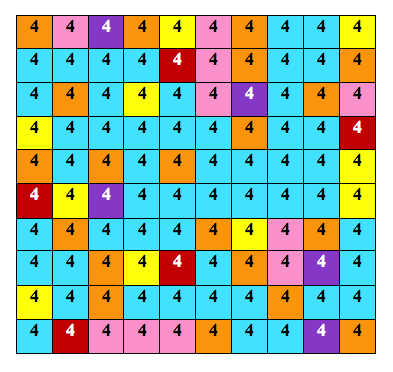 What fraction of the garden are 400 flowers? Do you know of any other way to write this? What fraction of the flowers are blue? Do you know of any other way to write this? What fraction of the flowers are orange? Do you know of any other way to write this? What fraction of the flowers are yellow? Do you know of any other way to write this? What fraction of the flowers are purple? Do you know of any other way to write this? What fraction of the flowers are pink? Do you know of any other way to write this? What fraction of the flowers are red? Do you know of any other way to write this? 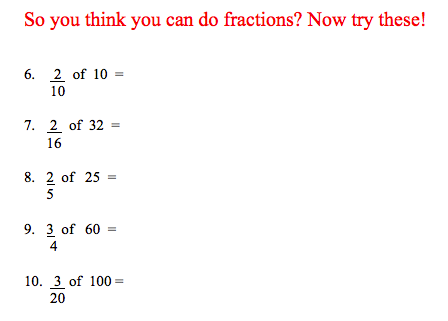 Now write your thoughts about what you have just done and what you have just found out about fractions. If Ben sells each flower for the following prices, how much does he earn altogether? The gardener and the mixed up flowers. Ben the Gardener looked at his garden. He always managed to grow beautiful flowers and plants. He had a Talent for this. A friend of his, Bill the Baker, suggested that he grow flowers and sell them to people. Ben thought this would be a good idea. So he planned how many flowers to grow. He had a large growing garden that he could use to grow the plants from seeds. He split this garden into 100 equal boxes. In each box he planted a flower. But he had no way of knowing what colour the flowers would be when the grew! This is what he saw when the flowers grew. He stood in front of his flowers and wondered how to answer Bill. How would you answer Bill? Work with a partner to figure out what fraction of the garden Ben had grown of each colour.